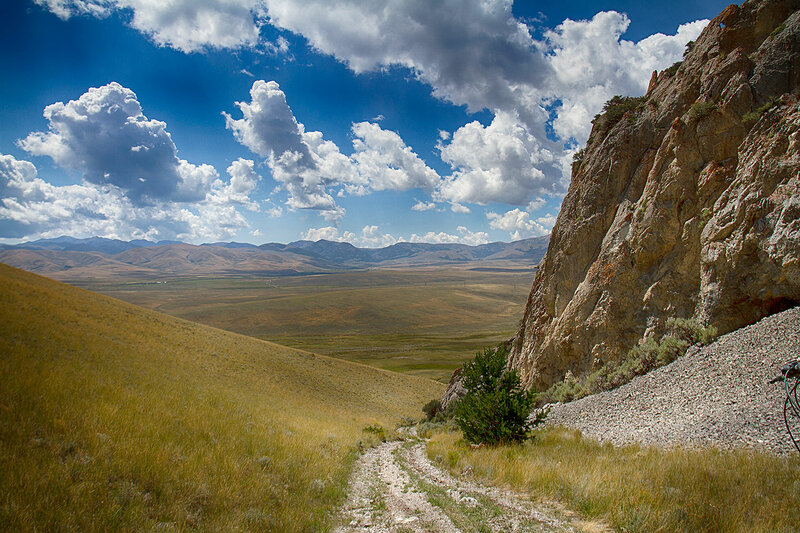 Not far from Clark Canyon Reservoir is the Big Sheep Creek Back Country Byway, a gravel and dirt road that winds it way through BLM and private land for 50 miles. Any time I see scenic and back country in the same sentence, I am in. And so we went. We stopped first in Dell, where the road starts, at Dell Mercantile, a small side of the road store that sells one of everything. And gas. We grabbed a giant cinnamon bun for a sugar rush later and headed west. 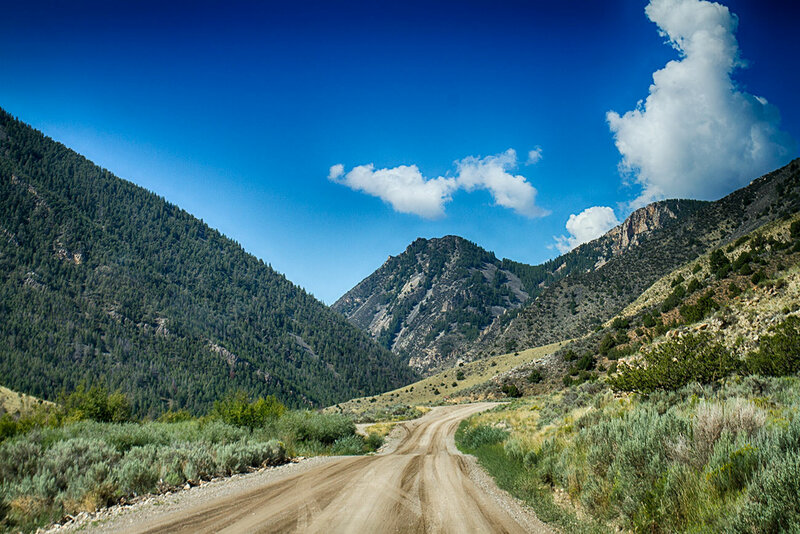 The Big Sheep Creek Back Country Byway starts out following Big Sheep Creek back into a canyon. 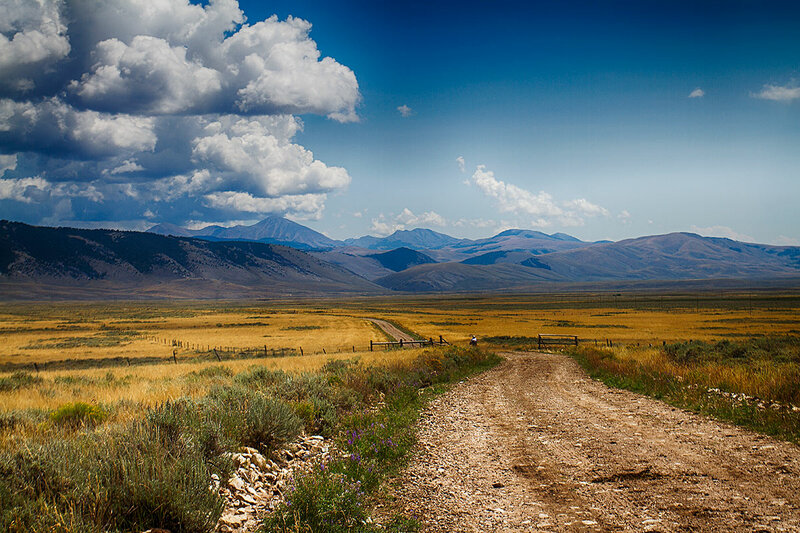 The road here is pretty easy – wide gravel with only a few potholes and an occasional washboard area. 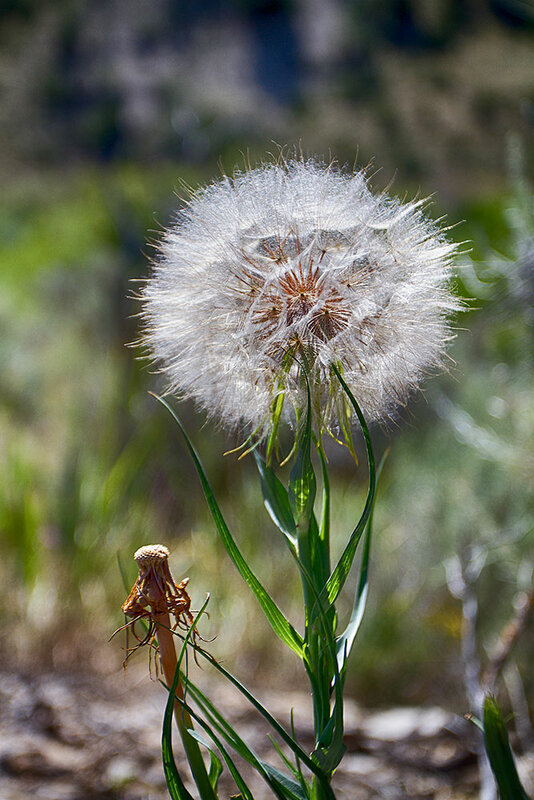 The area is teeming with wildflowers, prickly pear cacti, and sagebrush. 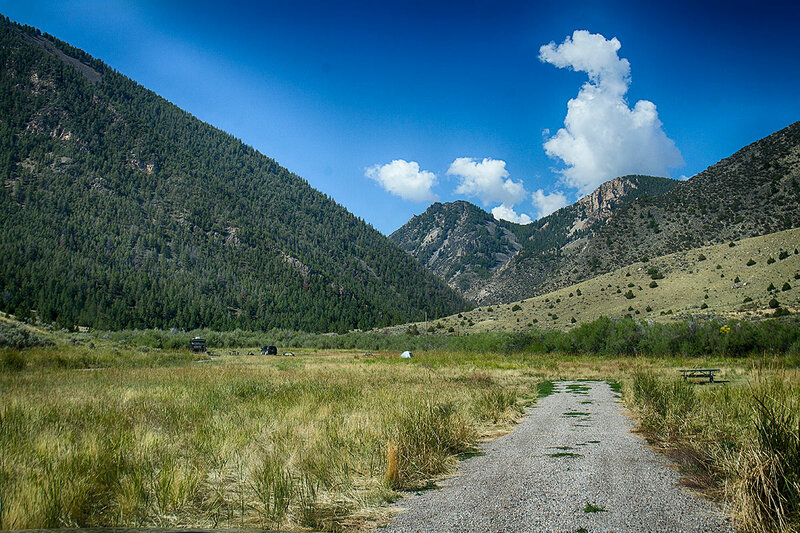 A couple of miles down the road is Deadwood Gulch Campground. 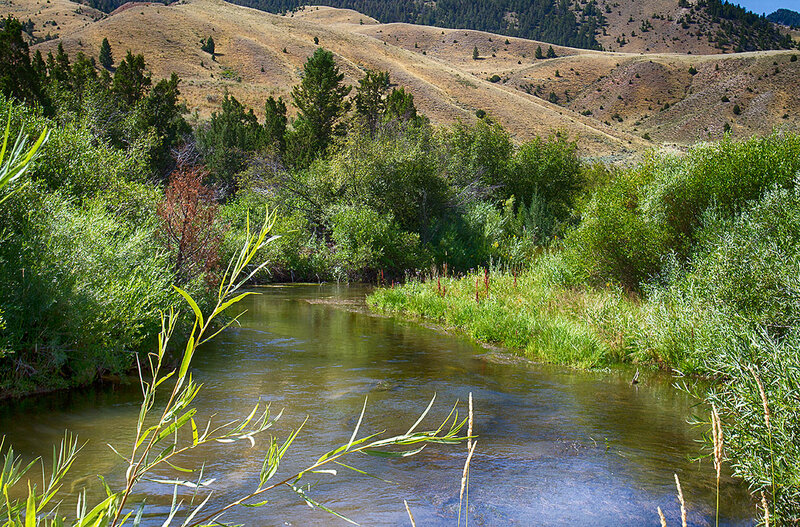 The campground is on the creek and, with only six sites, would be a great place to get away from the crowds. 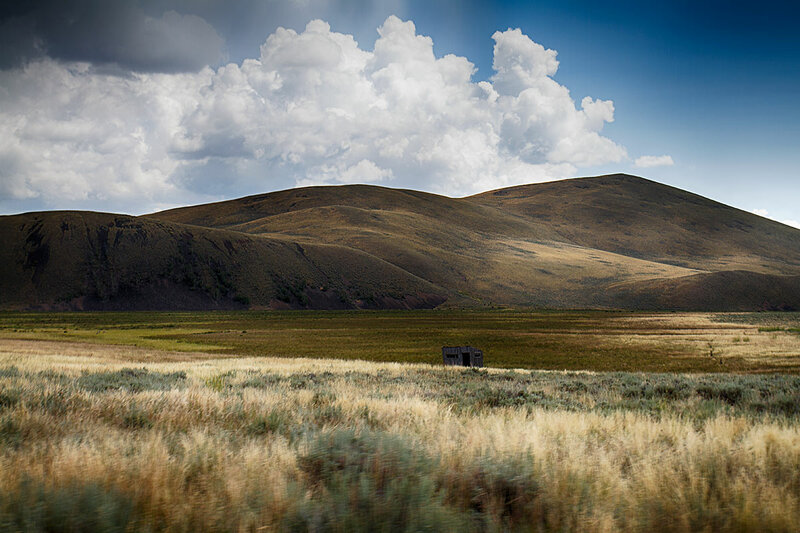 In this area of Montana though, there really aren’t many crowds. One note about the campground and Big Sheep Creek Back Country Byway: there are many small bridges to cross and they all have weight limits. The one into the campground is seven tons (too low for the short bus). Others on the road are five tons. There is boondocking all over the place along the byway but it is best done with a small trailer or class B and we saw a few of both. The road continues following the creek into a small canyon. 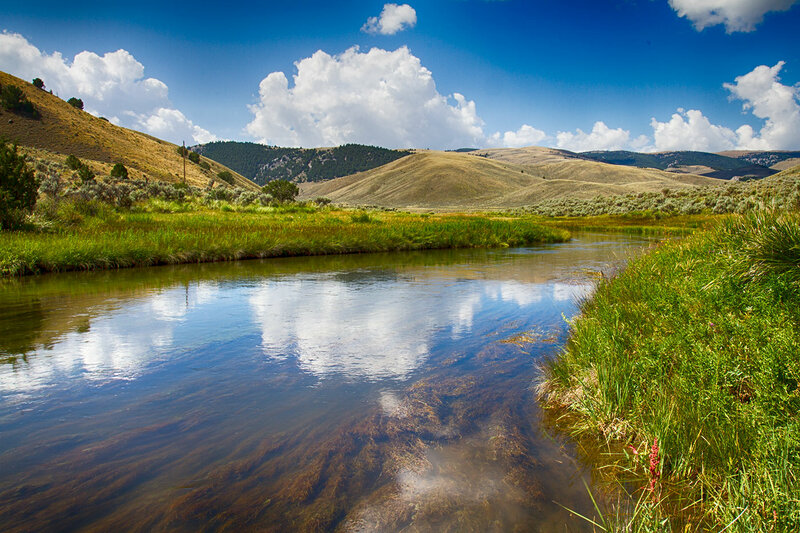 Further upstream, the creek is wide and slow – it might be an enjoyable area to kayak, provided the water level is high enough. 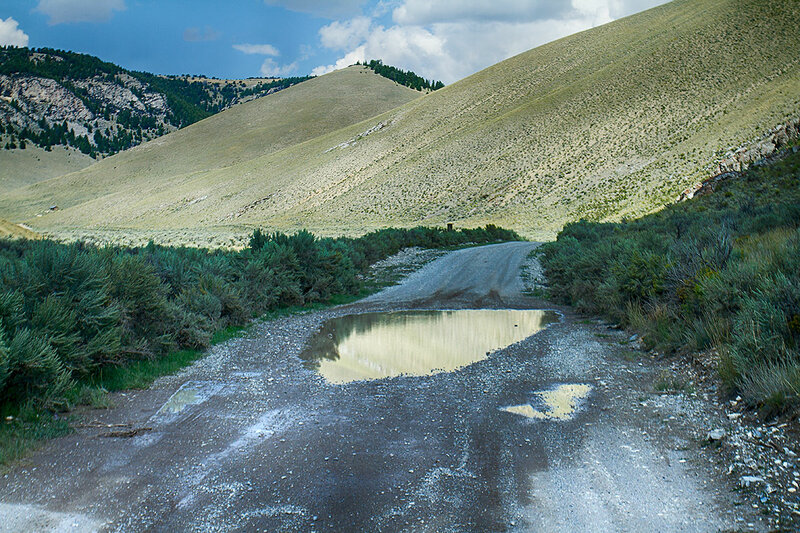 The road then turns away from the creek and heads into a completely different landscape. The changed once again and we were in rolling hills and grassland. We came to a fork in the road, and we took it. Actually, we first went left. There was a giant hill with a road running up it beside the left fork. We just had to look. 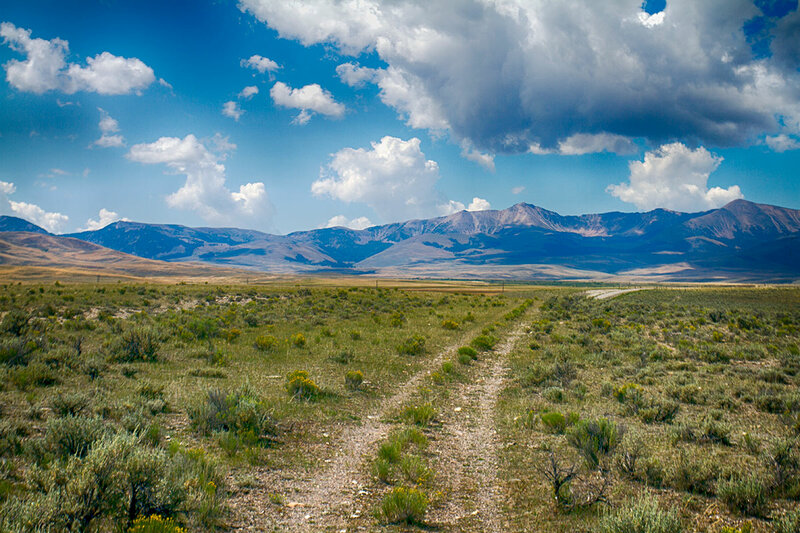 We continued along the back country byway. We started to get hungry so we looked for a place to stop. Mike saw a road going up toward the right so he took it. From the bottom, it didn’t look too steep. By the time we got halfway up, we realized our mistake. 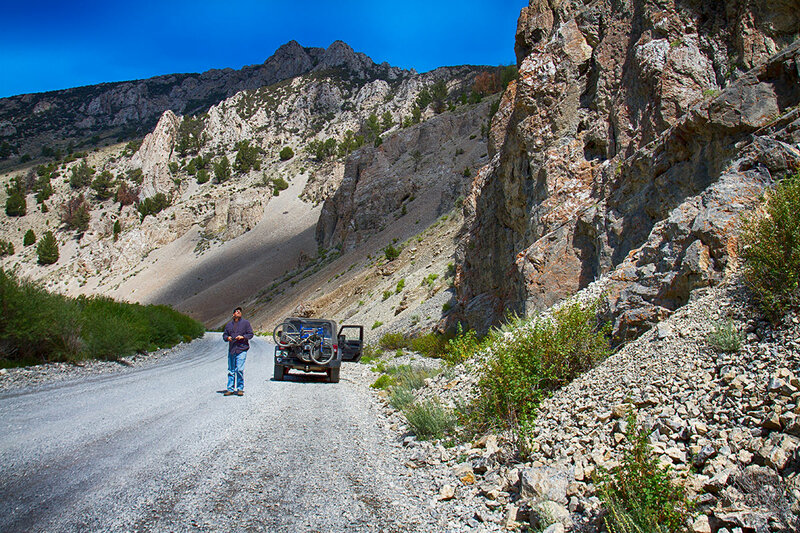 The road was so steep that, when we stopped, I didn’t want to sit in the jeep for fear it would slide down the hill. My camera cannot adequately capture the steepness of the hill – two dimensions just don’t convey it very well, especially using a wide angle lens. But, as usual, the jeep was more capable than we were and five minutes later, after picking our way back down through ruts and rocks, we were safely back on the ‘real’ road. (See that thin scratch of white just right of center? 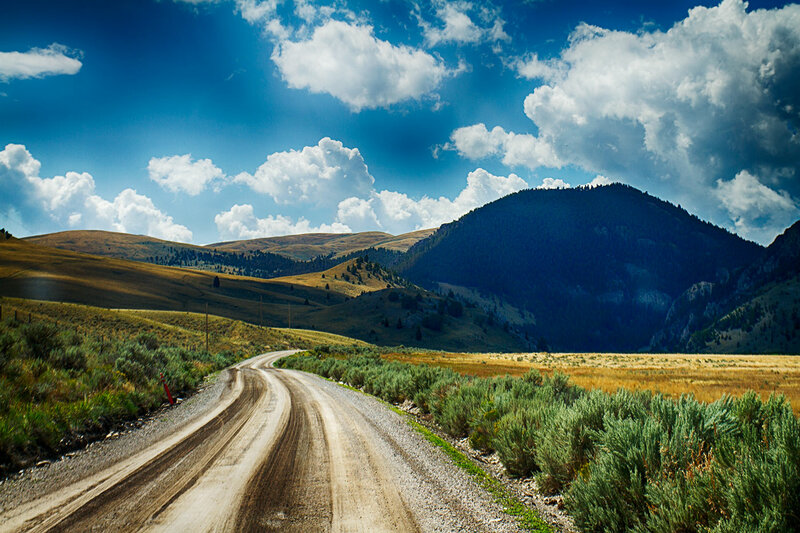 that is the road.) I will admit, the view is spectacular up there. And we ‘could’ have gone higher. 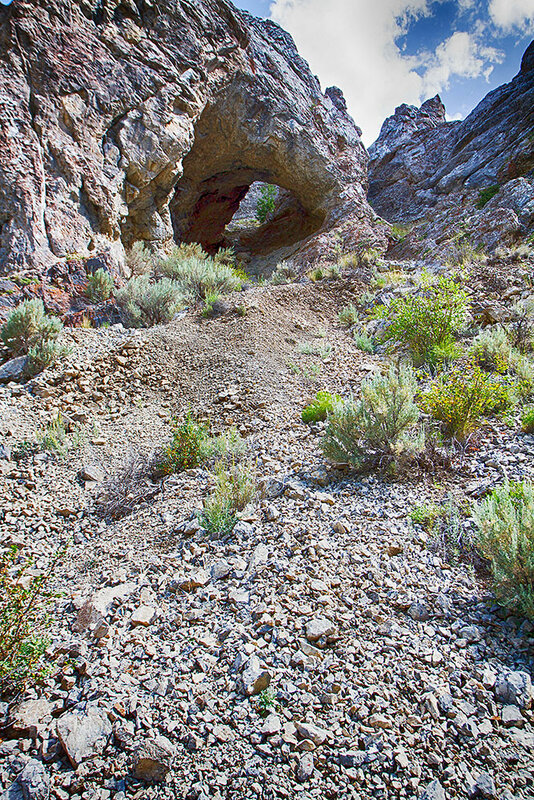 But, without climbing it first on foot to see what was coming, I wasn’t ready to continue up. We hadn’t had enough sugar for that. 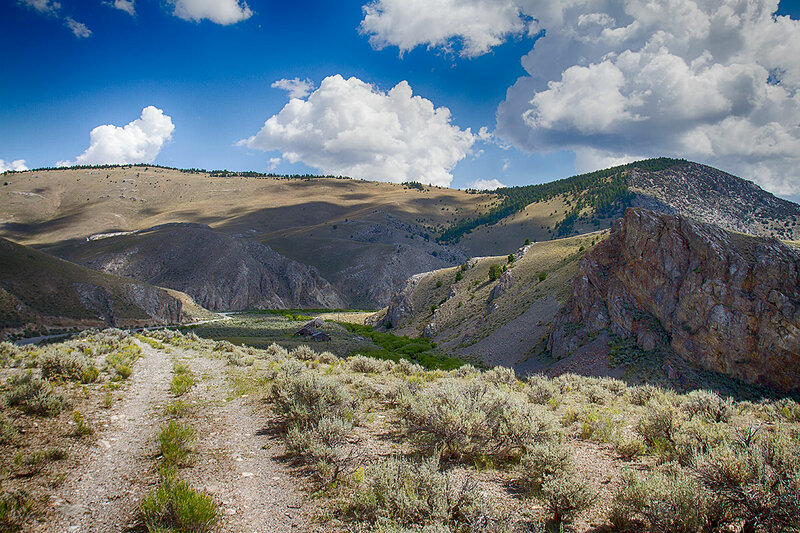 We continued on the Byway through a huge unpopulated valley. The only traffic we saw was six bicyclists, going the other way. And then the terrain, and the road changed again. I had read somewhere that, after rain, some of the road may be impassible due to deep mud. It had rained yesterday, and rain was threatening today, but so far, the main road had been easy. The gathering clouds gave us pause but, like most times, we didn’t want to go back the way we came. The dirt got softer and softer until the ruts were too deep to fight against. It was obvious that a truck had recently passed, when the ground was REALLY wet, and the truck had a wider wheelbase than we did. We popped the jeep into four wheel drive and went for it. I would have pictures of the road but it was too bumpy to capture anything usable (try snapping while hitting your head on the roof) and if we stopped, we weren’t going to move for a very long time – it was starting to rain which would only make the road worse. The clay mud mire only lasted a couple of miles and we were free, though we picked up a few more pounds of mud to add to our collection under the jeep (chunks of it would fall off over the next few days) and the road changed again. 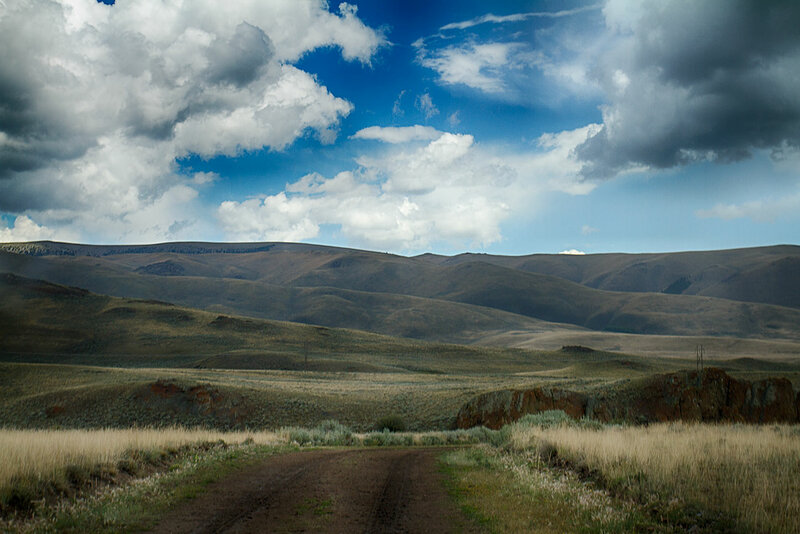 We were in a ranching area – mot of it owned by one family. It was huge and went on for miles. We dodged cows now instead of rocks and potholes. 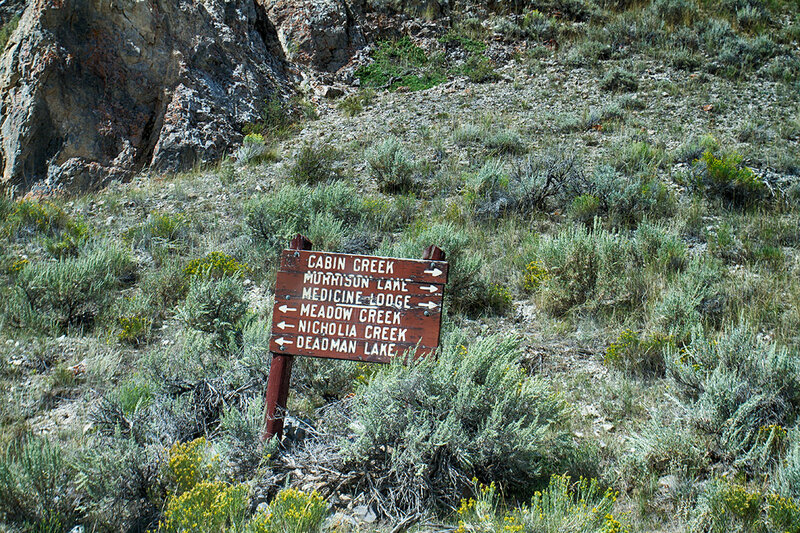 At the end of the road, we took a right, and headed a few miles back to Clark Canyon Reservoir. All things considered, it was a beautiful drive. 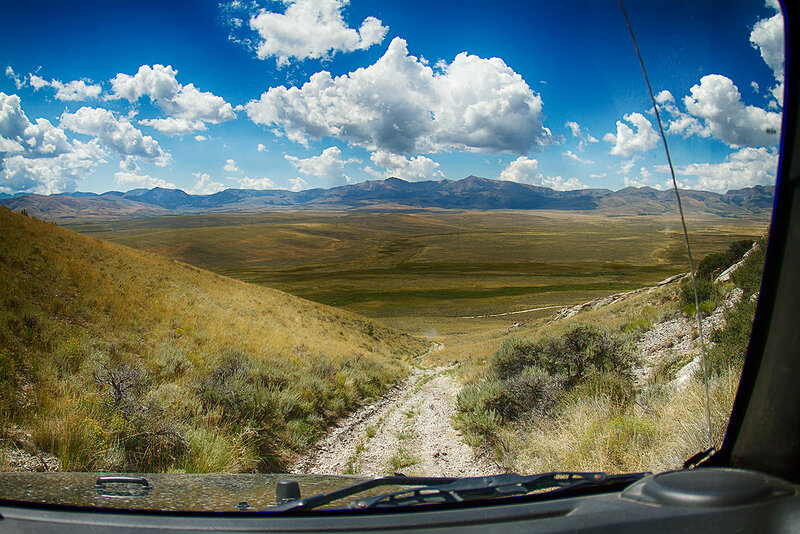 We got to see more of the Montana back country with its huge variety of terrain. 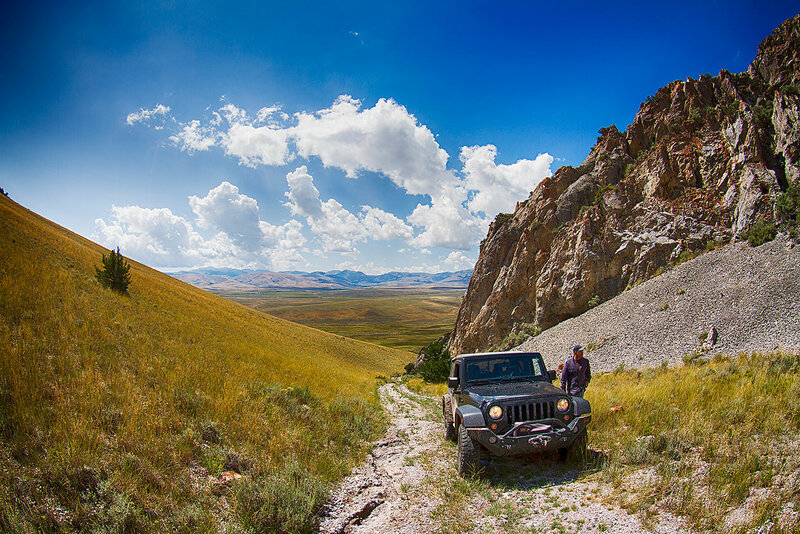 We spent a few wonderful hours off the beaten path testing ourselves and testing the jeep. When we travel these roads, which we do often, we are fully prepared. We go with food, water, a full gas tank, paper maps, a car GPS, a handheld GPS, and a DeLorme Inreach. If we can’t see the road ahead, or we question its condition, we scout ahead on foot (we can get miles of hiking in just by scouting roads). 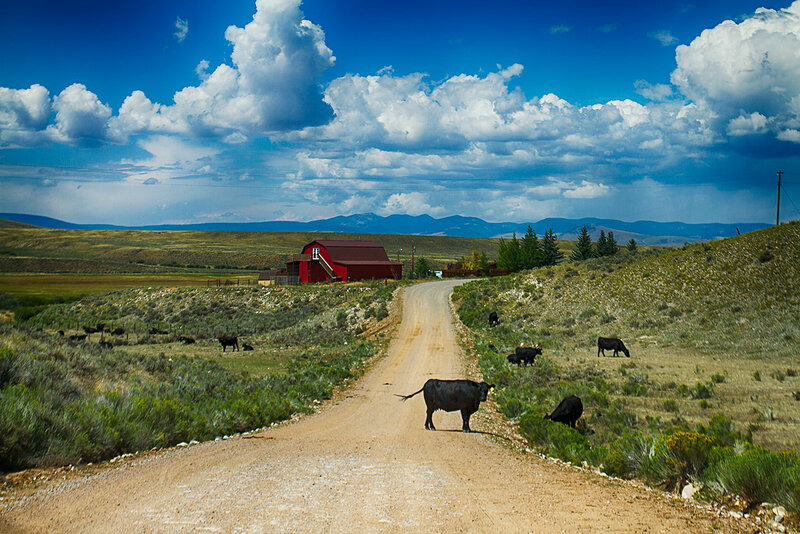 While we have run into problems (high centering the jeep in a creek and being trapped in a pasture with an angry bull are two of the most memorable), we have gotten pretty good at avoiding them or being prepared when we don’t. This particular road is pretty benign and can *usually* be traveled by a two wheel drive passenger car; we try to make the most of it and add side roads for a little fun. After spending a couple of days in a private park, we were looking to ‘get away.’ So we headed south looking for a place to boondock. 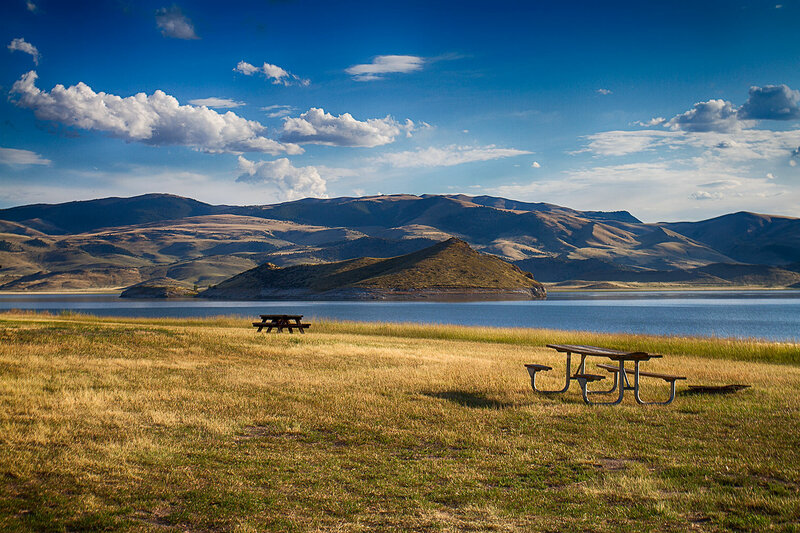 We made it all the way down to Clark Canyon Reservoir, a Bureau of Reclamation area with many campgrounds around the lake. 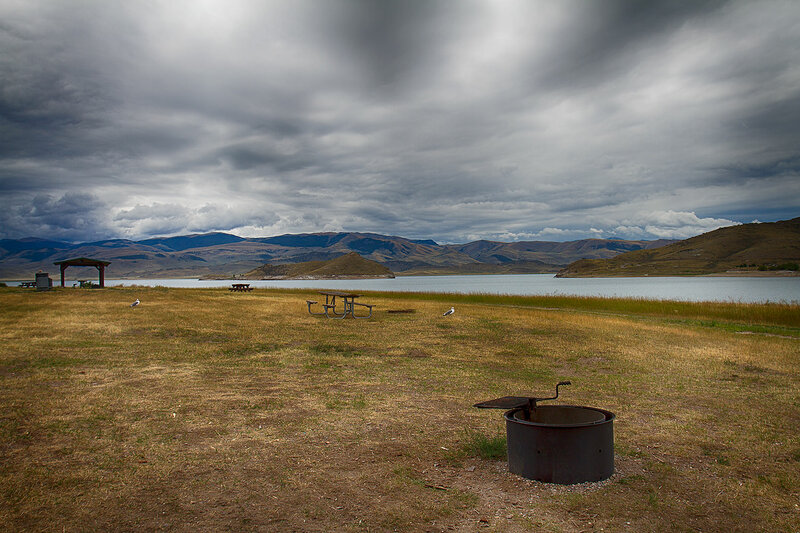 We checked out a few of the campgrounds and returned to the first one: it was closer to the highway but it provided beautiful views, sheltered picnic tables, a water pump, and a large lakeside site. On the other side, if needed there is a full hookup campground for RVs ($30/night). In the afternoons, clouds would roll in providing a wonderful respite from the heat. The winds would pick up, the sky would drizzle for about half an hour, and then it would all go away. 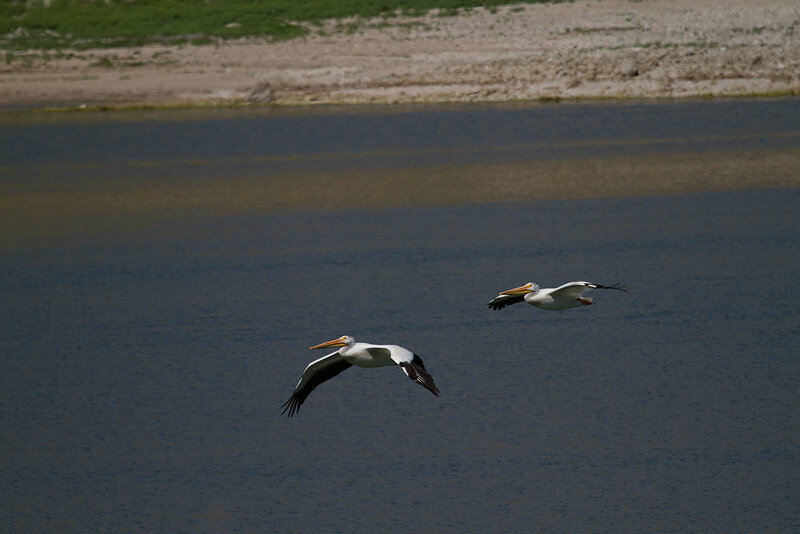 While there, we got to see lots of birds, including bald and golden eagles and strangely, pelicans. I had always thought Pelicans were a more tropical bird. See, I learn something every day. We spent afternoons watching the shadows move across the mountains. 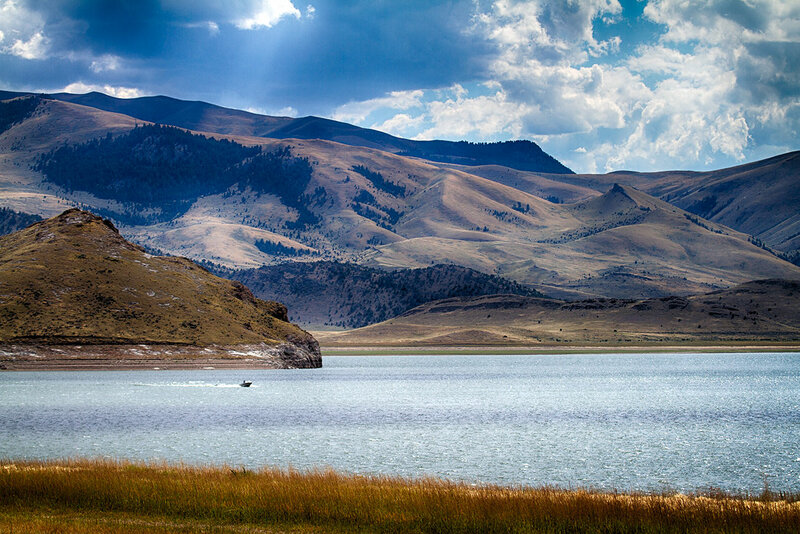 Clark Canyon Reservoir was a very peaceful, enjoyable location to take in the sun, relax and just zone out. I even got out my hammock and hung it up in the shelter to rock in the breeze. We would have stayed longer than we did but we ran out of water. We will one day be back, though. I woke up, pulled on some sweats, and shuffled to the kitchen to check our battery charge. 75%. More than enough for a pot of coffee. I flipped on the inverter, then the coffee pot, grabbed my kindle and flopped on the couch. I raised the blackout shade to take in the view and let in some much needed light. Some time after midnight, a fifth wheel had pulled in, so close he would hit the short bus with his awning if he extended it. Yikes. I pulled the shade closed. In the world of boondocking etiquette, this is a no-no. The parking area we were in would hold ten rigs easily and none of them within spitting distance of each other. There was a second parking lot one had to pass through to get to the parking lot we were in, and it was empty. Why was he here? On top of us? It didn’t much matter anyway. We needed to run back into Kalispell to fix our water problem. At our last campground, we were pretty sure we blew our water inlet pressure valve as every time we turned on our water pump, water gushed out the city water connection. We bought a replacement and did the repair at our boondocking spot, but water still spewed. There was a connector attached to the check valve, and the water seemed to come from there. We tried to replace the connector with another one we had but the hose clamp was a permanent clamp, not the typical unscrewable type. I have no idea why these are used as hoses can and often do ‘pop,’ but these permanent hose clamps must be cut off and even then, leave what they are connected to with a piece of hose hanging off of it that is impossible to remove without a chance of serious finger injury (we know, we tried – if you know of tool that can remove them, please let me know!). So that we would have water for the night, we McGyvered it. For the record, a Sharpie fits quite well into the hoses used on a Bounder. We duct taped the Sharpie in place and we had water again! So we went back to the RV parts store we had found outside Kalispell and picked up the new part we needed, and a bunch more of similar parts and some hose. Just in case. It took all of three minutes to make the repair, after over an hour the day before of trying unsuccessfully to get that stupid hose clamp off the hose. 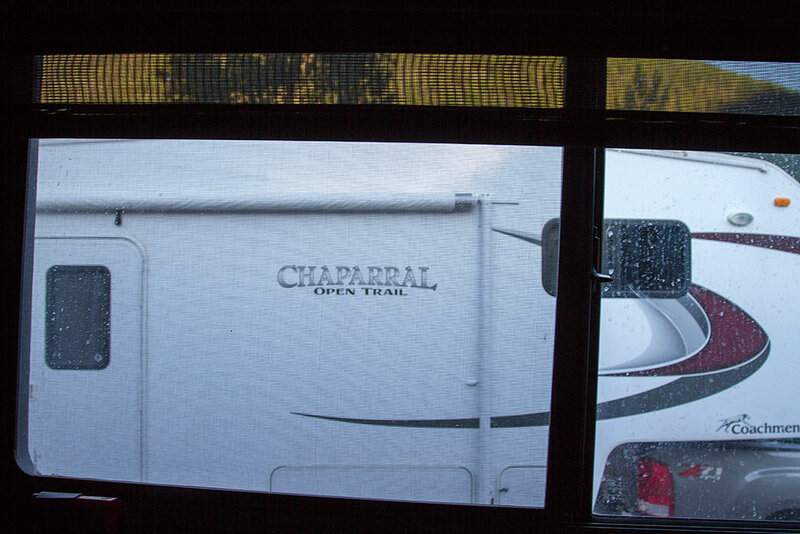 We wanted to test our system and stay close to Kalispell so we found a private RV Park (Crooked Tree Motel and RV Park – $35) not too far away and hid out there for a day. It was the weekend so were weren’t going to have any luck finding a public campground – everything is packed this close to Glacier. We grabbed burgers, t-shirts, and huckleberry stuff right next door at the Huckleberry Patch and, for the prices, the burger and fries were pretty good. The burgers are extremely customizable, so we both got what we wanted. Sunday, we headed out to Salmon Lake State Park for four days of relaxation.